The modern celebration of Mardi Gras (Fat Tuesday, Carnival, Shrove Tues) involves parades with people wearing masks, consuming copious quantities of alcohol and taking off their shirts...but a better way to prepare for the lean days of lent might be to pickup this masked custom creation. Mardi Gras is an oft-misunderstood festival of celebration in preparation for lenten fasting and penance observed in the Roman Catholic and Anglican tradition. The name Fat Tuesday comes from the ritual clearing rich & fatty foods from the shelves of pantries in preparation for the fasting and eating bland foods for lent. Bland is not a word that can be used to describe this custom built T-bird named "Roxanne" currently bidding on ebay. 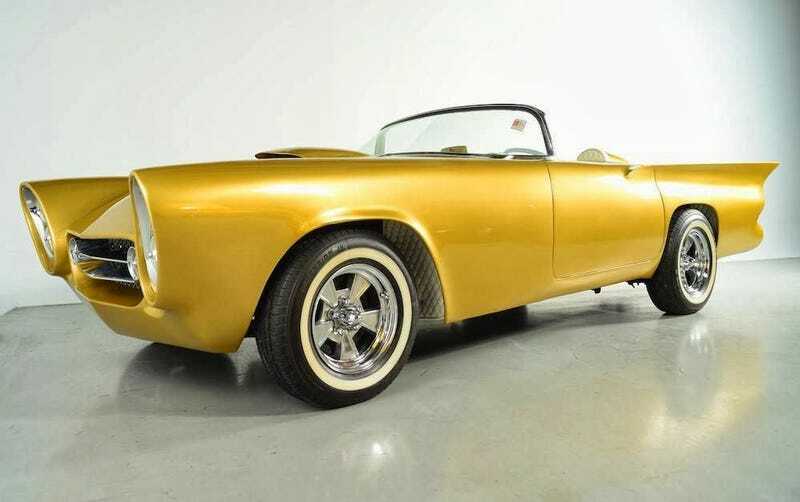 Find this 1957 Ford Thunderbird Custom for sale in St Louis, MO from the guys at MotoeXotica currently bidding on ebay for $12,600 reserve-not-met with 4 days to go. MotoeXotica is a purveyor of fine (and strange) automobiles, and their inventory is always worth a look. They specialize in finding odd low volume cars in nice shape, celebrity owned junk and nutty stuff and put them in detailed ebay listings with nice photos. The premium you pay for an AMC based Batmobile might be worth it because they have mechanics and experts look over the cars and fix the little things before selling for profit. Everybody has got to eat, right? Taking a chance on a sight-unseen original condition late model is one thing, but a thoroughly customized T-bird that looks like a '58 Continental is going to need a detailed inspection from a expert who will be able to tell you if the body is going to separate from the frame on your way down the freeway. A large classic car dealer like MotoeXotica has done that work for you already. Roxanne is powered by a 351 cubic inch Ford V8 that is only described as "high performance" but limited information is contained on the specifics of the build or who built the car. There are grainy pictures of this exact car at a car show on a french language forum about custom hotrodding, but no details. The interior is even more outlandish than the exterior (if possible) and includes the skin of several diamond patterned Naugahyde beasts and a golden rotary telephone....just in case Maxwell Smart calls you from his shoe phone. Roxanne sold for $26,400 at the January 2014 Scottsdale Barrett-Jackson auction, so it can only be assumed that the reserve is somewhere north of that number - but someone put a boatload of time, money and effort into this thing. Originally posted as DTO: Laissez Les Bons Temps Rouler: 1957 Ford Thunderbird on Daily Turismo.